The term “stylish sliding barn doors” might seem like a misnomer to most people. Up until recently, the idea of mounting a barn door inside your home would have bought you a ticket to the local insane asylum. This home design trend, believe it or not, has caught on and caught on big. To pull it off, or pull it open, so to speak, you will need to find the right barn door hardware kit. Back when a barn door hardware kit was only used on, well, a barn door, that wasn’t such a difficult problem to solve. However, in 2018 there are plenty of these hardware kits to choose from. We can help you narrow down your search for the right barn door hardware kit to suit your needs and preferences by providing you with some of the main features to look for when shopping for them. The information you gain from our buyer’s guide can then be used to make comparisons among the various models presented in our barn door hardware kits reviews. The combination of our buyer’s guide and reviews will allow you to be better informed and prepared to make a well-qualified decision whenever it becomes time to purchase the right hardware kit to suit your décor. With that objective in mind, let’s take a closer look into the benefits and features of barn door hardware kits. Why do you need a barn door hardware kit? The uniqueness of using a barn door as part of the décor of your home as well as the novelty of it is sure to draw attention from every visitor you have. Because of this fact, you will need a barn door hardware kit to perfectly match the overall scheme of you décor. In addition, the hardware used to hang your door will be extremely important for the overall function of the door itself. What benefits can you expect from a barn door hardware kit? It is pretty hard to fashion your own barn door hardware to function properly and have the look which matches your décor. 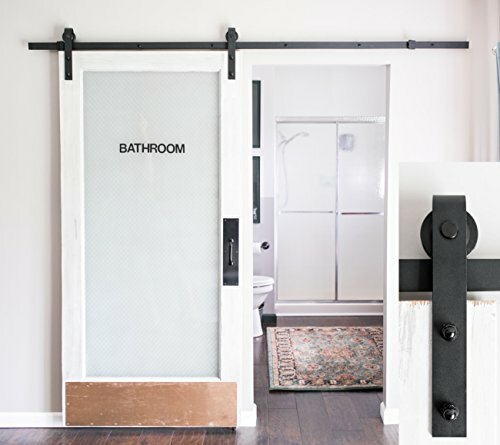 A barn door hardware kit keeps the guesswork out of the installation of this particular novelty. The components of the kit are designed to work together to create the property balance for smooth operation as well as maintaining a consistent theme throughout. 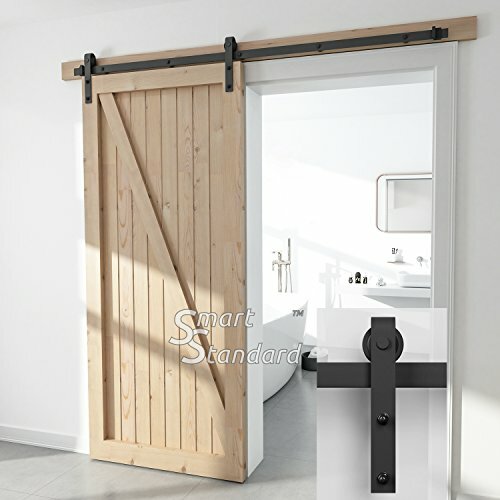 What are some features to look for in a barn door hardware kit? 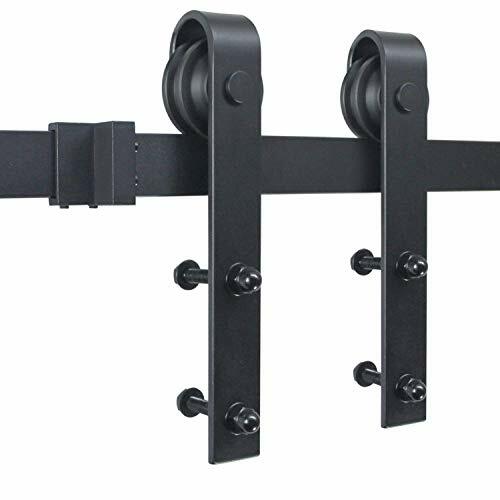 Barn door hardware kits are fairly new when it comes to installing them inside your home. Consequently, there are not a huge number of features to consider, but there are some general ones to keep in mind as you work to select the right design to fit your needs. Matching the hardware color to your color scheme is an important feature to consider. In most cases, you will want to look at black hardware to go with gray, light blue or teal, or deep reds and whites. However, in rooms with more of an autumn hue or various shades of pink or darker blues, you should go with a coffee color. Be sure to go with the darkest shade that you can get your hands on and don’t settle for a lighter tone of brown or black. Sizing a sliding door is much different than sizing a hinged door. With a hinged door, part of the clearance is taken up within the door opening, but with a sliding door, especially a barn door, the clearance goes well beyond the door opening. At minimum, you should have the same distance of clearance as the distance of the opening for the door to clear. Essentially, you door hardware will need twice the width of the door opening for clearance on either side of the opening. If the opening is wide enough for two doors, then you will need half of the opening width on both sides of the opening for clearance. The door opening plus the clearance will be the size of door hardware kit you will need. If the opening is an odd size, then buy a larger set and cut the rail or track to fit the clearance you need. Besides the door opening, the thickness of the door has to be taken into consideration as well. The clearance of the door will be determined by the distance that the rail is offset from the header above the door. The rail should accommodate the door thickness without dragging the door along the surface of the wall or the adjacent baseboard, yet not leave a large gap between the wall and the door when it is closed. The design you want to go with will depend upon your overall décor and how much attention you want to draw to this feature. Designs can range from the very simple to ornate elegance. Matching your décor is of obvious importance, but functionality is another part of the design to keep in mind. After all, a conversation piece like this loses its appeal very rapidly if it does not slide easily or begins to fall apart. You want hardware that is made of solid steel and rollers with at least two bolts in each roller to support the weight of the door. Operation of the door will be dependent upon how well your hardware kit will hold up under the weight of the door that is hung from its rail. Doors with glass panels will be lighter and can function with a hardware kit that is rated for a light door, but it is best to plan for the most substantial hardware you can get your hands on. Anything under a weight limit rating of 190 pounds is going to be suspect when you are considering a solid core wood door. Just keep in mind that the thicker and harder the door material is, the heavier it is going to be. If in doubt, go heavier on your hardware rather than attempting to cut costs and not have enough strength to handle your door. Taking the various features and benefits into account, you should be well enough informed to compare the various hardware kits in our reviews below. These reviews should help you to narrow your buying choice to the door which best fits your needs and preferences. Though the Industrial by Design 8-Foot Heavy-Duty Sliding Barn Door Hardware Kit is a simple and straight forward design it is a durable one. This kit is designed to accommodate up to a 225 pound door on its standard 96” rail. It includes 2 heavy-duty hanger/roller systems with two bolt door attachment. You can get this door in single, double or bypass styles and it comes only in black. This hardware kit is made of durable steel and supports up to 225 pounds. It is pretty straight forward and built for solid performance. It includes a 100% money back guarantee if you are not satisfied with this hardware kit. The simplicity of this design might not appeal to all tastes and it only comes in black. You want a durable straight forward design for an opening between 3 feet and 4 feet wide. Those looking for more elegance won’t find it in this design. 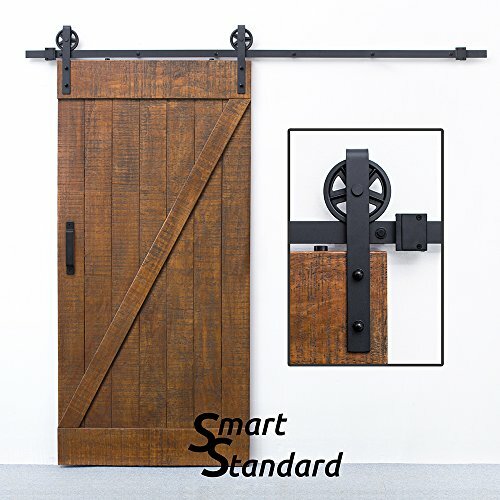 SmartStandard has designed the SDH-0066-Standard-BK Heavy Duty Sliding Barn Door Hardware Kit to handle up to 220 pounds and fit door openings from 36” to 40”. Its 2 hangers are designed to accommodate 1-3/8” to 1-3/4” thick doors. Besides its 80” rail, this kit also includes a floor guide, stops, spacers and end caps. This is a pretty solid hardware kit with a weight capacity of up to 220 pounds and fits a standard 3-0 to 3-6 door. You can get this hardware kit in nickel, bronze or black matte finishes. It utilizes J-shaped hangers and includes a limited lifetime warranty. You will need a minimum of 6” of header clearance above the door opening with this kit. It is a pretty simplistic design if you are looking for more elegance. You are looking for a simple design for a standard sized door opening with a few additional color options. Those looking for more a more ornate finish or have limited header space might not be pleased. 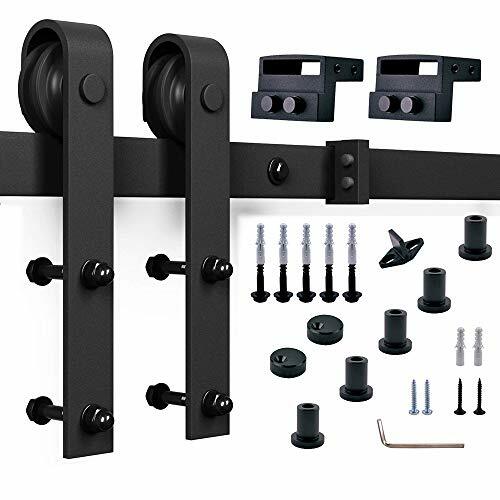 The big wheel hanger design of this SmartStandard SDH0080BIGWHEELBK Heavy Duty Sliding Barn Door Hardware Kit is what sets it apart from the others. This kit includes a standard 96” long steel rail to fit 42” to 48” door openings and door thicknesses of 1-3/8” to 1-3/4”. The weight capacity rating is 220 pounds. It features large sized open spoke rollers on the hangers to add a twist to the overall appeal of the feature. You get plenty of strength and durability with this kit as well as some additional novelty with the open-spoke rollers. This operates very smooth without any binding due to the heavy-duty rollers. It accommodates doors up to 220 pounds as well as door wider than the standard 3-0. This hardware kit only comes in matte black finish. The larger rollers will require a greater amount of header space above the door opening to accommodate its additional height. You want to add another simple twist to the novelty of the barn door concept and enjoy the smoother operation of the larger rollers. The additional header space required might limit some users from making use of this kit. Another affordable choice from SmartStandard comes in the simplistic form of the SDH-0080-Standard-BK Heavy Duty Sliding Barn Door Hardware Kit. This kit is also heavy-duty enough to accommodate doors weighing up to 220 pounds and with 42” to 48” by 1-3/” to 1-3/4” dimensions. It also comes on a 96” rail and includes J-shaped rollers as well as the necessary stops, spacers, floor guide and end caps. Without spending a lot of cash, you will get all the strength and durability you need to hang a wider than standard single door with this kit. It is rated to handle up to 220 pounds as well as 3-6 to 4-0 door openings. It utilizes high quality steel J-shaped rollers with two-bolt fastening in its design. This kit will require a minimum of 6” of available header space above the door opening for installation. It only come in matte black finish and with the straight strap hanger style. You are looking for affordable simplicity for a single oversized door opening. You might not be impressed with the lack of design creativity in the hangers. This Vancleef 11FT Bypass Door Kit Sliding Barn Door Hardware sets itself apart by having a little different style of operation. It uses quality steel in its double track, bypass design and each of its tracks accommodates doors weighing up to 200 pounds each. It utilizes nylon in the rollers to allow for quieter opening and allows you to only need half of the opening width clearance on either side of the door opening. It accommodates 2 doors of up to 3-6 x 1-3/4” in a 7-0 opening. This kit allows you to use up less clearance space because of its bypass operation. The use of nylon in the rollers helps to make this unit operate quieter and smoother. Bulkiness is limited with this setup while still allowing you to have the barn door look. Installation of this unit is more of a challenge and requires greater precision to keep it balanced. Though you give up clearance in one sense, you add to clearance width and will need a full 12” of header space above the door opening for mounting. You have limited clearance space beside a wider door opening. If clearance above the door opening is also limited, then this will not be your best solution. 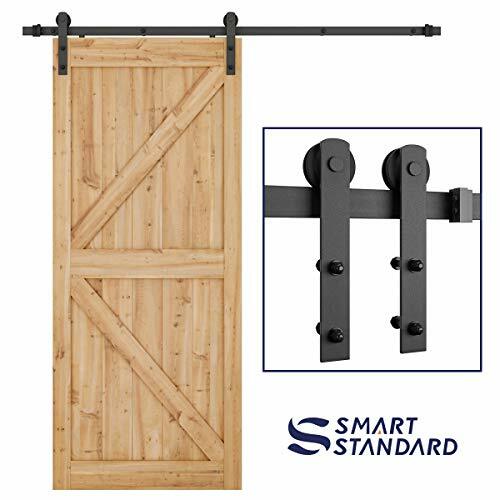 If you are going for a more rustic look to cover a much wider door opening, the DIYHD 10ft Bent Straight Rustic Black Double Sliding Barn Door Hardware Kit might be the answer you are looking for. This kit is designed to accommodate a pair of 5-0 doors opening in opposite directions on it 120” track. 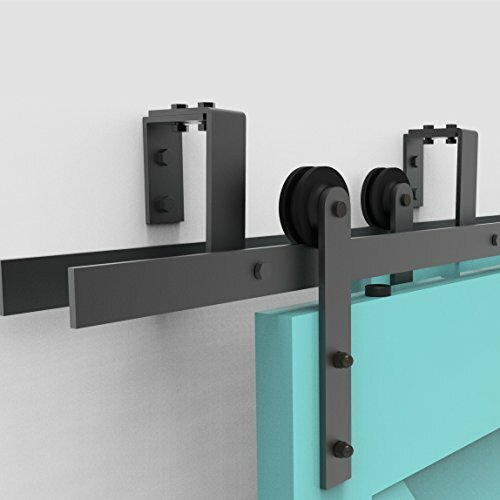 It utilizes a pair of steel rollers on each door for a maximum weight of 200 pounds each and accommodates door thicknesses up to 1-3/4”. It comes equipped with 4 rollers, floor guides, spacers, end caps and stops for full installation. You will be able to cover an opening of up to 10 feet wide with this paired door set without having to install a massive 10 foot wide door and have the clearance to accommodate it. The hangers are double bolted and are J-shape hangers for easy installation and smooth operation. All of the necessary hardware is included. Finding five fee of clearance on both sides of your door opening might be something of a challenge. The weight capacity is a little bit disappointing given that a door that is 5 feet wide is bound to weigh more unless it is much thinner. You have a wider opening to cover and plenty of clearance on both sides to accommodate the doors and track. Be sure to double check the weight of your doors and go with thinner doors if possible. 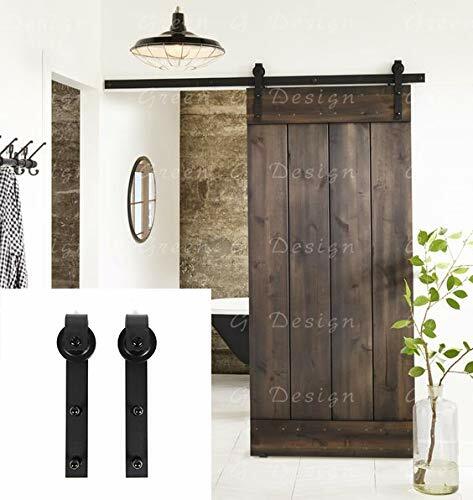 The touch of design elegance included in the DIYHD 8FT Ornate Cut Black Iron Sliding Barn Door Hardware Kit just might be the thing to finish off the look you are going for. Rather than using a straight or arrow design, the hangers included in this hardware kit are cut black iron to add a little embellishment. This kit accommodates doors up to 4-0 by 1-3/4” and will support a weight of up to 200 pounds. It comes with all of the necessary spacers, guides, stops and end caps for a complete finish and it comes in a matte black finish. You will get a bit more elegance out of the design of this barn door hardware kit. It is well suited for openings up to 48” wide and includes all of the necessary hardware for a clean finish and smooth functioning. The weight rating for this kit is a little bit light. It would be nice if it had additional color choices. 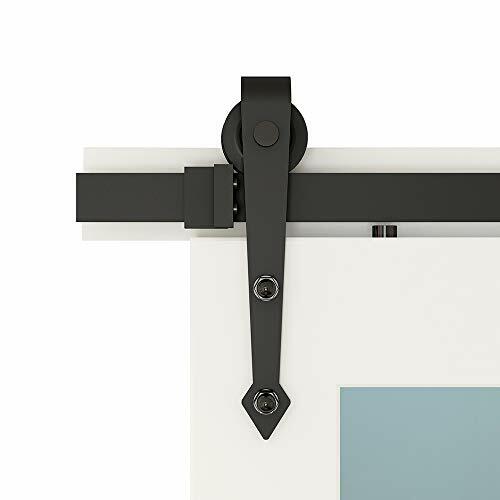 You want to add a splash of elegance to the hardware kit you use to hang your barn door. You will need to be sure that it will fully accommodate the weight of your door. At first glance, it is hard to see any difference in this SmartStandard Sliding Barn Door Hardware Kit and any of the others we have reviewed. The difference is in the I-shaped hanger used for mounting the door. With this shape of hanger, you can get away with mounting this kit in areas of lower header clearance. This kit is still able to carry the weight of a door up to 220 pounds, and dimensions between 3-6 and 4-0 by 1-3/8” to 1-3/4”. This is a stable and durable kit which accommodates doors up to 220 pounds and comes with all of the hardware for a clean finish. It utilizes I-shaped hangers which allow for a lower header clearance requirement above the door opening. I-shaped hangers are not quite as secure or stable as J-shaped hangers, so this option should really be a necessity rather than a design choice. You have limited header clearance above the door opening where you wish to install this kit. If you have more space, go with J-shaped hangers. The most affordable kit in our review comes in the form of the Erfect 6.6 FT Brown Basic Wood Barn Door Steel Antique Style Sliding Hardware. Though it is affordable, it does not give up on quality. This kit is rated to support a door up to 220 pounds on its carbon-steel rail and J-shaped hangers. It also accommodates doors that are up to 2” thick and comes in an antique brown/coffee color. Made of durable carbon-steel, this kit is plenty strong to accommodate heavier and thicker doors. It is designed for 3-0 to 3-3 openings and utilizes J-shaped hangers. This kit includes all of the necessary hardware for a finished installation and comes in antique brown/coffee color. You will need more header clearance above the door opening to accommodate the J-shaped hangers. You want a little bit different color choice and heavier duty hardware at an affordable price. If you prefer black or lack header clearance above your door opening, this is not the kit for you. Smooth and quiet sliding is what draws attention to the OuTera Sliding Door Hardware Set Sliding Barn Wood Track Hardware Kit. This kit will accommodate doors up to 200 pounds and allow them to slide more smoothly and quietly on its high-quality nylon rollers. The kit comes with a 72” rail to accommodate door openings up to 3-0 and thicknesses up to 1-3/4”. It comes with all of the necessary components for a complete finish and comes in matte black color. This is a solid kit with the necessary strength to handle 3-0 doors up to 200 pounds. Its nylon roller allow for quieter and smoother operation. It has been tested to last for up to 120,000 opens and closes and comes with a 100% satisfaction guarantee if you are not pleased with the door. In spite of the testing, the nylon rollers are a potential weak point in this product’s design. There is little creativity in color and design selection. You are seeking a quieter and smoother operating barn door hardware kit to accommodate door openings up to 3-0. If your opening is wider or you want a little bit more elegance in the design, you might be disappointed with this product.